One Healthy Meal Just Got Easier! When I was at Whole Foods I came across Stahlbush Island Farms Organic Fully Cooked Brown Rice and Black Beans in the freezer section. Hmmm…must try. On top of being organic, Stahlbush Island Farms practice sustainable farming and use 100% biodegradable packaging. It gets better. All I have to do to eat the rice and beans is microwave or heat on the stove top for a few minutes. Score. 200 calories makes a side dish, small meal, or large snack. And to get 7g of fiber and 8g of a complete protein for that is awesome. For under 10 minutes of work. I’m all in. I usually heat up the whole bag at once because I’ll eat the rice and beans within a few days. 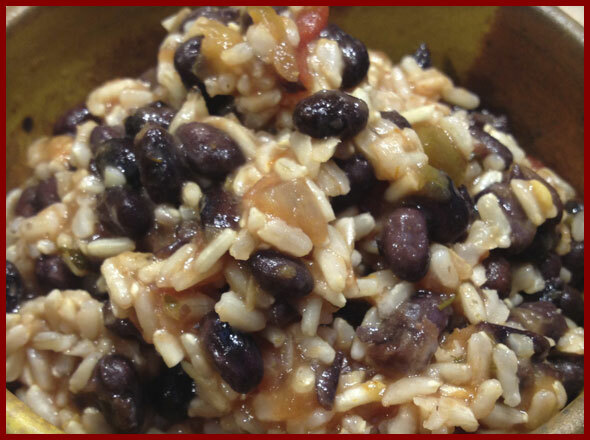 But you can heat your rice and beans up a serving at a time and leave the rest of the bag in the freezer. Whatever works best for you. Try them and let me know what you think. If you come up with another rice and beans recipe, let me know. I’m always looking for new ideas!